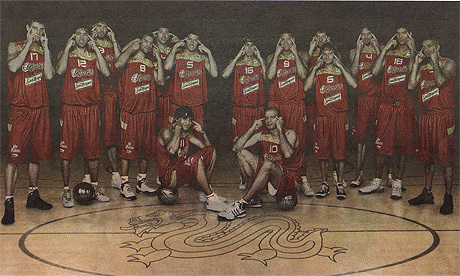 When I first saw the Spanish basket ball team’s slit-eyed photo, I was baffled. I couldn’t work out what the gesture was about. Slit-eyed people? Do they mean us? It may also have something to do with the timing. Chinese media only caught the story after it was raised during the daily news conference during the Olympics. Search “Spanish basket ball team” in Chinese and you get dozens of results all saying “Spanish basket ball team apologized for the guilian (making a face) photo”. One blogger commented that if only the story was broken 24 hours earlier, before the two countries’ basket ball team met, then the Chinese team might be more motivated to resist Spain’s comeback. Something deemed to be friendly may not be felt the same way when seeing the light. I guess like gwailo, the slit-eyed gesture was originated at a time of ignorance, when mocking people’s racial characteristics was more acceptable. Whether those participated in this public display thought the time hadn’t changed or the viewers would think the same I have on idea. The advertiser who insisted to take this photo may think it was harmless fun to mock Chinese in such a way when they only thought the Spanish-speaking population as the targeted audiences. But in a globalised world, this is insensitive to say the least. I frowned on the photo when I thought I finally worked it out, some of my fellow countrymen would shrug it off, but I can understand others may be furious and hurt. Spanish media seem to think all the fuss about this is storm in a tea cup, a misunderstanding of Spanish culture, or even a witch hunt. However, whether stereotyping is playful or hurtful can only be decided by those are being targeted. In this instance, the Spainish may well do their image some good by opening their eyes.